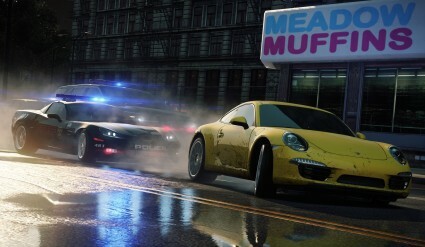 Need for Speed: Most Wanted Review - This Is My Joystick! The Need for Speed series is possibly one of, if not the longest running series of driving games on home consoles, having debuted way back in 1994 on the 3DO system (hands up who remembers that one). It is also the most successful, having sold well over 100 million copies worldwide, and unlike many successful franchises it has been passed through a variety of different developers in its time, perhaps one of the reasons for the franchise’s ongoing success. That made the announcement earlier this year that EA was handing the reigns over to Criterion Games in its entirety a touch surprising. Considering I have never really been much of a fan of driving games it has been something of a shock to find myself covering two in as many months. Fortunately NFS: MW couldn’t be more different to F1 2012, firmly breaking my long-held belief that all driving gcames are the same. The question remains, though: is it any good? The sharp-minded of you will realise this is not the first time we’ve seen the title Need for Speed: Most Wanted. 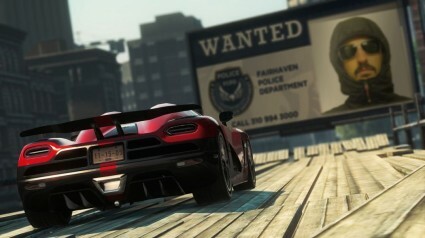 Unlike the 2005 title, the Most Wanted this time refers to a selection of ten cars that are the most wanted drives in the City of Fairhaven, and the main purpose of the single-player game is to earn the opportunity to race for these particular vehicles. You do this by earning enough Speed Points to unlock a challenge and then must beat the Most Wanted car before wiping it out to unlock it for yourself. NFS: MW is an open world racer that gives you a little bit of variety compared to your regular driving title. There are a selection of different events to take part in, from the standard Sprint (checkpoint) or Circuit (marked out laps) races, to the Speed Run challenge that needs you to hit a specific average speed through a number of checkpoints. These events are really only half the story, however. Being an open world game, you have the freedom to simply drive around what is a fairly large city avoiding these scripted events for large periods of time if you wish. 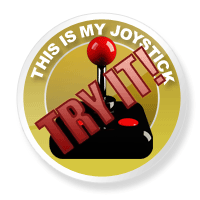 To keep you occupied there are a number of things to do, which are effectively the game’s collectibles. The smallest and easiest to find of these are the speed cameras dotted around the city, with you simply needing to set one off to unlock it. Once you have triggered a speed camera it shows a leaderboard of you and your friends’ recorded speeds, and immediately the first little side game opens up as the challenge is set to get a higher recorded speed than anyone else. The second of the collectibles are the billboards, unlocked by jumping through them. Again, once unlocked they open a leaderboard with air height being the statistic measured. As an additional bonus for topping the leaderboard on any of these, your face will appear in your friend’s game on the billboard. Nice touch. The third and largest set of collectibles are the cars themselves, represented by Jack Spots across Fairhaven. Once you have found the Jack Spot you can switch to the car it represents by driving alongside and pressing Y. You can then switch to this vehicle any time you like via the quick drive menu. Once you have unlocked a car, its set of races becomes available and are highlighted on the map to allow you to set a waypoint to the start. You can also use the quick drive menu to jump to the starting area of a race you have previously been involved in to try and better your performance, again for those all-important leaderboards. Once you arrive at the start you need to trigger the event by wheel spinning, done by pressing the accelerate and brake buttons together. All of these unlocks, along with the race events, earn you the Speed Points needed to meet the challenge of the ten special Most Wanted cars, and create yet another leaderboard to compare your own performance in the game to that of your friends. As mentioned earlier, the Most Wanted challenge comes in three parts with the first being meeting the relevant SP target to challenge for the car. Part two is a race against the vehicle which you must win to open part three: taking out the vehicle. Only when you have successfully passed all three will you open the vehicle for yourself. The cars themselves have just enough of a difference to allow you a favourite, but the overall feel is that of an arcade racer underlined by two major factors. The first is the fact that there is an achievement for power sliding for a certain distance of a bend. The second, and I understand the irony of this statement from someone who doesn’t like driving sims, there is no option for manual gears. The arcade feel underpins the entire experience, from the slow-mo effect of your major crashes to the regular police chases that are triggered as you drive around the city, and is enhanced by the handling of the cars. While it took me a bit of time to work it out and get used to it, a little dip of the brake as you enter a bend will not send you spinning uncontrollably into a wall like it does in other racers. In fact, when timed just right it enhances your grip round the corner, and along with the handbrake you can use it to vastly alter your direction without having to slow yourself right down. Finishing in the top three of any of the events will earn you an upgrade for your car, such as a change of tyres or nitrous to boost your speed. These upgrades can be equipped and removed quickly and efficiently but are only ever on or off. The difference the change will have to your vehicle is clearly stated, but again the design is to keep you out on the road rather than stuck in a menu adjusting sliders. As you would expect from a racing game the cars are all beautifully re-created and the city of Fairhaven is also a big plus. There is plenty of variety around, from built-up inner city streets to off-road dirt tracks and everything in-between. When doing anything on road you will need to be aware of the number of NPC vehicles that you’ll find in your way. Pass me the Ray Bans; it's blinding out here! 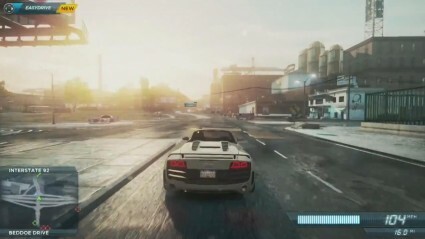 The weather effects add a lovely polish to proceedings with rain having the desired effect on the feel of the car and the player’s vision, while coming out of a tunnel at the wrong time of day will see you temporarily blinded by the low sun, which also reflects off other vehicles to cause an additional hazard to your driving. The crash scenes mentioned earlier also deserve an extra mention, as at times the way in which they are produced and displayed will make you want to drive head first into an oncoming car or power-slide into a wall just to watch the effects. There is a good mix of music throughout the game, with some modern and recognisable chart hits to shake your head at. This music flows through the entire game and when in-car you have the option to skip tracks with the RB button. This music is punctuated by a sat nav-style voiceover that throws a few hints at you and also updates you on challenges and unlocks, suiting the overall style of the game beautifully. The cars themselves sound pretty decent overall, with engines grunting and tyres screeching to help with the feeling of speed. Add in the little punch of the nitrous and the epic crashes, and the overall effects package is pretty decent. Multiplayer underpins NFS: MW in its entirety with the aforementioned leaderboards and the ‘Autolog Recommends’, which are essentially friend challenges on the various events and unlocks throughout the single-player set up. I love the smell of burnt rubber in the morning! There is also a dedicated multiplayer mode that follows a similar fashion to the single-player game, in that there are various different events to compete in and vehicle unlocks to pick up via the Speed Points. Once you join a game you will get a meet up point, and part one of any event is the race to get to the meet up first. Once all have arrived the event starts and you score points for your performance. At the end of an event you will get a short delay before the next meet up point is declared, and the cycle starts again. Throughout you will also gain extra SP for taking out your competitors at any time. This both adds and detracts from the experience in equal measure, as races get an additional tactical element, but the brief waits at the meet up before the event starts and at the finish before the next meet up is declared rapidly deteriorate into a rather frustrating destruction derby. The other big difference is that races are team affairs rather than free for alls, with the field split into two pools of four meaning you can pick up some bonus SP even if you finish dead last. This works to help newcomers get up to speed without taking away from the vets. I’m actually quite surprised at just how much I’ve enjoyed playing NFS: MW. In what is a total break from the norm I have found a light-hearted, easy to pick up racer that offers enough variety and depth to keep my interest while never bogging me down with sim-style tweaks. This same statement is probably enough to put off a lot of race fans who will likely find the simplistic, arcade handling a little off-putting and the lack of control over the customisation a bit of a slap in the face. You probably already know which side of the fence you’re on, but if not I recommend you give Most Wanted a go.